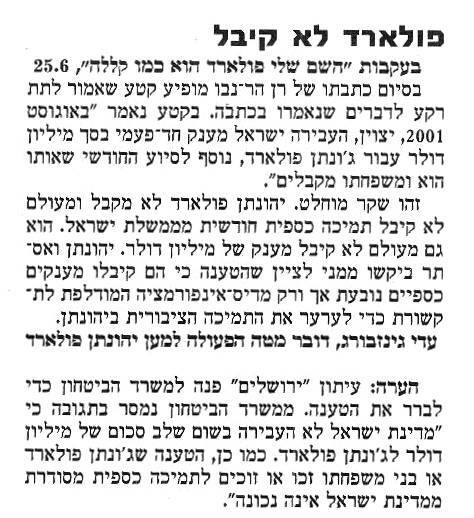 At the conclusion of the article by Dan Nevo "Ha Sheim Sheli Pollard Hu Kimo Klalah" (Yediot Achronot 25/06/04) a section appears which is apparently supposed to provide background for the article. It reads: "It should be noted that in August of 2001, Israel provided a one-time grant of one million dollars to Jonathan Pollard, in addition the monthly support payments that he and his family receives." "Eton Yerushalyim" contacted the Ministry of Defense to verify this claim. The Ministry of Defense responded that "The State of Israel has never at any stage given a million dollars to Jonathan Pollard. Similarly, the claim that Jonathan Pollard or his family received or are receiving regular financial support from the State of Israel is not true."